After years of trial and error, I’ve found the perfect way to cook a whole turkey. 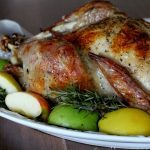 How to Roast Turkey in a Bag will guide you step by step through the simple process of preparing and roasting a moist, tender and beautiful turkey for your holiday gathering! I cooked my first Thanksgiving dinner when I was 19 or 20 years old. It was in a little apartment on 6th avenue in Salt Lake City. The floor of the kitchen was covered in turquoise carpet, with matching turquoise counter tops, turquoise stove and fridge. Those were days before Google and Food Network. Days of trial and error. Many, many errors on my part! After years of cooking turkeys and trying to guess what time the turkey would be done (or if it was done at all) and the debate over should I or should I not baste the turkey, do I or don’t I cover the turkey in foil, I decided to go the poultry bag route. My mom was a believer for many years before I jumped on board, and Mom’s turkeys were always, always moist and delicious. Mom was right. This is hands down, the easiest, foolproof method of cooking a turkey I have found. Here’s my step by step on How to Roast a Turkey in a Bag with tips included in the recipe. If this is your first time cooking a turkey, or if you are a seasoned Thanksgiving host, you’ll love this method. 10 days till lift off. Ready? Do yourself a favor. Read this step by step guide on How to Roast a Turkey in a Bag all of the way through right now. Then once more before starting to cook. If you’re reading this and it’s the Sunday before Thanksgiving, and your turkey is still in the freezer. Get it out NOW. Place your turkey in the fridge and start thawing! Gather these items (above) and place on counter. I often use food handlers gloves, if touching raw poultry makes you queasy, get some. Not pictured, but important- the bag. A Large Poultry Roasting bag is essential for this recipe! so the flour coats the inside of the bag. Preheat the oven and adjust the rack. Warning. The next few photos are of a n aked bird. Not attractive. But necessary in this tutorial. Take the bird out of the packaging. It should be totally thawed. I usually set it on a large jelly roll pan, or in a cleaned out sink. Remove any turkey parts in side of the cavity. There is usually a neck and organs from the bird inside of the cavity. Sometimes these parts are wrapped in plastic, sometimes, they are loose. You will find at least two, sometimes three items to remove and discard, or use to make gravy. Tip turkey on its side and release any water. Pat dry with paper towels and discard paper towels. and wings from drying out while cooking. Observe in this photo how I was a little too aggressive in tying up my bird. in my beautiful turkey. Be firm, but gentle. Here’s a better overall shot. Run the string under and on top of the bird, tie. Gently. Then season with salt, pepper, garlic (or garlic salt) and poultry seasoning. Place the turkey inside of the bag that has been coated with flour. (or sometimes I just dot the butter on top and skip the melting) on top of the turkey. Gather the ends of the bag together and tuck under the bird. Seal the end of the bag with the little twisty tie in the box. Tuck under the turkey. Cut 5-6 one inch slits in the top of the bag. so you can read it while it’s in the oven. Or make sure there’s a place to insert an instant read thermometer. Place it in the oven, just below the middle rack, remove any racks above the turkey. Cook according to the size of turkey. The gauge is reading 170 in this photo. thermometer in the turkey breast. remember, the internal temperature will continue to rise about another 5-10 degrees after removing from oven. It is safe to remove anytime after the thermometer reads 170 degrees. After the turkey has set out for about 10 minutes, gently remove the bag. Cut the bag away and gently peel away from turkey. Cut the strings as well. Use lifters or two big forks and transfer to a serving platter. turkey s done. Or not. I can’t tell you how many times my little sensor has not popped up. Wow. Did you cook that? That’s what your in laws are going to say. Set rack on second to bottom rack in oven. Remove any racks above. Preheat oven to 350 degrees. Remove the turkey bag from the box and add 1 tablespoons of flour to the bag. Shake the bag so it is coated lightly with flour and set the bag in the roasting pan. Make sure to remove these from the inside of your turkey before cooking. Repeat. Make sure to remove before cooking turkey! Keep the neck to make gravy, see instructions below*. Pat the turkey dry (inside and out) with paper towels, and discard. If you are stuffing the turkey with dressing, now is the time to stuff the turkey. Loosely pack the stuffing into the turkey and secure the ends of the turkey with a skewer. Place the turkey on a jelly roll pan. Using string, tie up the turkey legs and the wings so they are close to the turkey body. If there is a band of skin close to the legs, you may also tuck the legs into the skin. Tying or tucking is necessary so the wings and legs will not dry out while cooking. Sprinkle with a generous amount of garlic salt or powder, poultry seasoning, salt and pepper. Pull the bag open, so it is easy to place the turkey in the bag. Leave the bag in the roasting pan. Place the turkey inside of the bag. Drizzle the melted butter and a couple of tablespoons of olive oil over the top of the turkey, try to cover most of the surface of the turkey. This will help the turkey to have a beautiful golden color after roasting. Take the loose ends of the bag and tuck under the turkey. Tie up the end of the bag using the zip tie enclosed in the package. or you may use some of the string to secure the end of the bag. Tuck under all loose ends. Cut about 5-6 1 inch slits in the top of the bag for steam to release. Insert a meat thermometer into the thickest part of the turkey thigh, through the bag, so the thermometer is on the outside of the bag. If you place the thermometer on the inside of the bag, it will be difficult to read. Remove from oven when turkey is done. The internal temperature should be 180 degrees if thermometer is inserted in breast and 170 if inserted in thigh. Let the turkey sit for about 10 minutes, then gently peel away the bag. Lift the turkey onto a platter for serving. Dump the juice from the bag into a bowl or saucepan and skim off the oil that rises to the top and use the remaining liquid for turkey gravy. Use my recipe for Simple Pan Gravy to make amazing gravy to serve with your turkey. -*Place the neck in 6 cups of cold water. You may add an onion, halved, carrots, celery and peppercorns. Bring to boil, then simmer gently for about 1 hour, or until meat is cooked. Remove neck and vegetables and discard . Let broth cool. Strain and use for turkey gravy. -Studies have found that more germs are spread when washing a turkey before cooking than if the turkey is simply patted dry and placed in the oven to cook. The reason relates to contamination of surfaces, utensils etc. -I've been cooking turkey in a bag for years and have found the turkey is usually done about a half hour earlier than the time listed above. I have cooked the turkey and had it show as done up to a full hour earlier than the time listed on packaging. If the thermometer says the turkey is done, trust the thermometer! If the turkey is done way earlier than you had planned, just let it sit on the counter, in the bag until ready to cut and serve. -Always, always, always use a meat thermometer. One year, I relied on the pop up insert in the turkey. It never popped up. I kept baking and baking and baking. No pop up. You can spend anywhere from $5 to $200 on a thermometer. Get one. You'll be glad you did! -You may use any combination of seasonings. I like garlic (powder or salt), salt, pepper and poultry seasoning. I've used fresh garlic, but didn't feel like I was able to cover the turkey as well as when using garlic salt or powder. Sometimes, if I plan ahead, I crush garlic cloves and place those in the melted butter. Fresh herbs are always wonderful as well. -You may place vegetable in the cavity of the turkey. Sometimes I cut apples, onions and celery in half and place inside of turkey before cooking. Discard after turkey is cooked. -If you cook a turkey with stuffing in the bird, make sure to pack it loosely. Allow for a little more baking time about 1/2 hour to 45 minutes. I like to bake the stuffing separately in another dish. This way, I can more accurately predict when the meat will be done. If I'm using a frozen turkey should I cut back on the amount of salt? Im going to use a roasting oven to free up space in the oven. Do you think that makes any diffrence and is the bag ok to use in there? Excited to try this! My first turkey! I would like to know the same answer to the question to Devon Christensen. I wondered if you think cooking in a roaster oven cooks faster. Last year I cooked a smaller turkey in the roaster because we also smoked a turkey and the roaster one cooked much faster. Hi Chris, yes I think it would cook faster in a roaster oven. Thanks for asking! Any adjustments if I’m cooking a boneless turkey breast? I have oven bags but no ties. What all can I use to tie up the turkey bag? I’m not sure what will melt or burn. I often find the bag ties are missing, or maybe I’ve just lost them! I use a regular tie from the grocery store, they type you find int he produce section. You may also use a small piece of string, such as bakers time or thread. 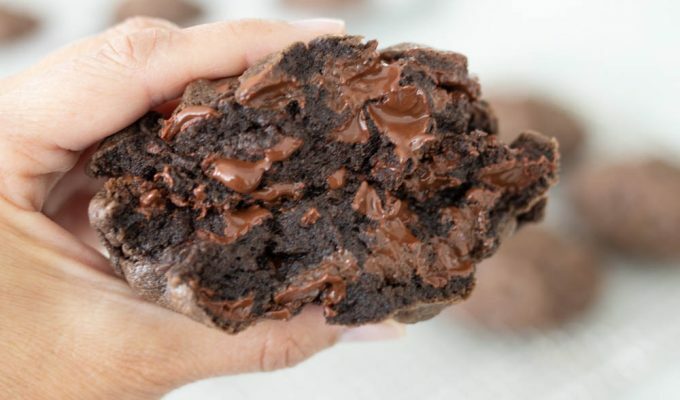 make sure it is inside of the baking pan! The turkey comes out so juicy, and never dry. Easy and fail proof. I’ve done a 12 lb turkey, 18, and 22lb and all were perfect! I hope this recipe answered all your questions about cooking turkey in a bag. I’m glad you have had such success with this recipe! Any advice on cooking stuffing inside the turkey? If you stuff a turkey before roasting, make sure you do not do it ahead of time, meaning, stuff and cook immediately to avoid food borne illness. Also, it will take longer to cook a turkey if cooked stuffed. Make sure to read the instructions on the wrapper of the turkey for exact time.